Sorry I have been mia, and if you are still out there, here is a condensed version of the last year. We lost my Dad to cancer. We decided to move towards a trawler but first a little landlubbing and time to sell our beloved sailboat. We found a cute little condo in Navarre Florida. It is surrounded by the Gulf Islands National Seashore. Our sailboat sold :-(. I grew orchids and we kept a few freshwater aquariums and a paludarium. Shell art. The beach we lived on has great shelling. Brian loved the home full of blooms and fishy critters. Our beloved anchor oil lamp. We had lots of fun hitting the antique shops for furniture. My love took me and my mom on a cruise. As much as we had fun, cruise ships really just isn’t our shtick. The swimming is fantastic. Swim Gulf side on calm days or swim in the sound side of the island on rough days. After looking for over a year we finally found our next boat, a 1983 Grand Banks 42ft classic trawler. she will be christened Rain Dog, period, no #2, or II, or TOO. We had an s/v Rain Dog and now we have m/v Rain Dog (she says defensively). The move from sail to power. Our Pacific Seacraft 34 to Grand Banks 42. After leaving Gilbert’s we headed north( ultimate destination Pensacola) a bit and anchored for a week at Akerbernaki key. Great protection from anything north. We has westerly too and that wasn’t very uncomfortable either. Anchored in north Card Sound off aberniski key. There wasn’t enough fetch to build any kind of big waves. Windy but fairly flat. Heading north to Coconut Grove Sailing Club. You can see Miami skyline off our bow. At times we needed to fend off other moored boats when current was contrary to wind. That is The municipal mooring field and Anchorage, it can get very rough and rolly. Weekends are insane here. Very busy on land and water. Makes one feel quite wussy being nervous about coming in under power to pick up our mooring, none of these vessels have engines. In fact,no power boaters at CGSC. Back to Rain Dog after a fun jaunt on Picnic Island. Scupper on high alert not to be left behind, as if! Sometimes I try not to look north. Try to ignore that Coconut Grove is right downtown Miami. Walking scupper I found this poor fellow left behind by the tide. I carefully set him adrift , plucky little guy headed for the open bay. For those concerned, yes, I know it’s a Portuguese man-o-war. No, I did not get stung. Yes, I was extremely careful. 👍 What a beautiful creature. Last walk before heading north. Heading north. Will be so glad to get away from the hustle and bustle of the city. Ahhh, open water, uh er I mean, open ICW. Hey! Fellow Pacific Seacraft!! Island Lady, PS31. Dink’d / walked over to the Atlantic to get some ocean fix. I spy with my little eye a tiny baby PMOW ( Portuguese man o war). So cute. Walked him out to deeper water, hopefully that was the right move. Godspeed my little friend( can you see him?). Here comes my taxi with my handsome hubby and said mutt. Poor scupper didn’t understand why he was only allow to walk about two feet before being commanded to pee then whisked away back to Rain Dog. Yes, he will pee on command. I know you are envious. Just east of lake Okeechobee side. Will post the second half of our trip to Pensacola soon. Hugs. Dry Head Blog, take two. Scroll down for new info. I am working on a review of our head after a year of cruising the Bahamas. I hope to post that review in the next couple days. Pensacola. My mom has come to visit in her RV, Tigger Too! Mom and I hit the beach for much needed therapy. We lost my father 5 months ago and it’s been really hard, especially on my mom. Rain Dog Is For Sale! We love our boat!! But we are moving over to a trawler( gasp). We still plan to cruise the US and Caribbean, just in a boat with two cabins for family and friends. I know for many, this is a baffling move to go from such a great vessel to a trawler, but ever since my brain surgery the wind has been knocked out of my sails and i just don’t enjoy the sailing aspect, love everything else about cruising. So, I cannot live on land( I’ll go mad), and we looked at cats(meh), so trawlers won out. We are headed to Pensacola for a while to rebuild the cruising kitty and to make the change from sail to power. Here is a run down about Rain Dog, will update as soon as I have more time. 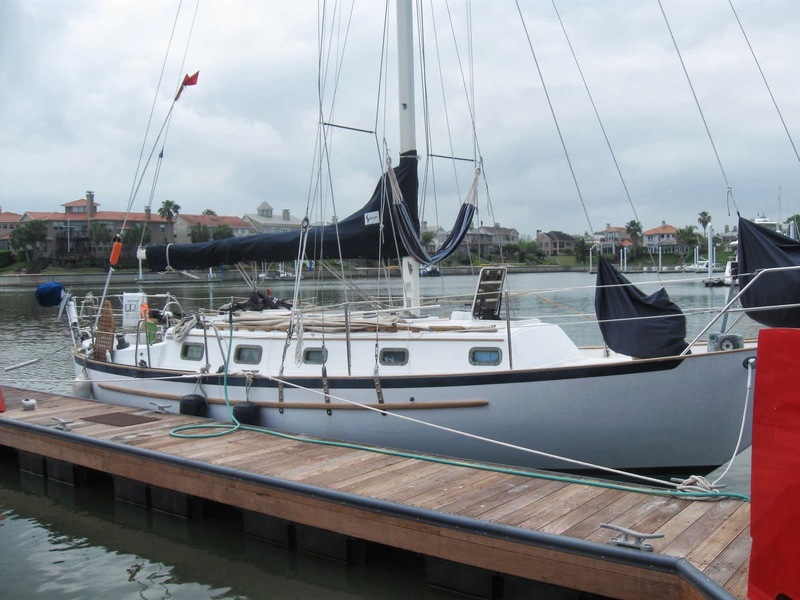 1989 Pacific Seacraft Crealock 34 hull #142.
reliable inboard yanmar 30hp diesel with two blade prop. Air Draft with antenna is 46. Displacement: 13500 lbs./ 6124 kgs. Ballast: 4800 lbs. / 2177 kgs. Water: 80 gals. Fuel: 40 gals. Underbody design allows for fantastic maneuvering and a spritely sea kindly feel. She has a brand new 40gallon fuel tank( not installed), this was given to us by another PSC34. Our fuel tank is fine, no leaks, looks great. But nice to have a brand new custom tank ready to install if needed. We bought all new chain plates ( bought from Pacific seacraft) and mast tangs/fittings( LaFiell). We bought them due to the age of the Rain Dog’s chain plates and fittings. Our rigger did a full inspection before we left to go cruising ( November 2014) and said everything looked great, so this new hardware is not installed. Sails:Spinnaker with ATN sock. She has a main sail with two reef points in good condition, hank on staysail in good condition, hank on storm stailsail in like new condition, hank on Genoa in good condition. Sail covers for Genoa and staysail need new zippers. All running rigging replaced in last 5 years. New topmast anchor and running light. She also has deck level running lights for close quarter navigating. Full no-see-um screen enclosure. Plus screens for all ports and hatches. Yanmar 3HM35F all manuals, lots of engine spares, including spare alternator. Runs beautifully, use about 2/3 gallon to achieve 6 knots. PSS dripless shaft seal (2015), new engine gages ( December 2014), Rudder gland re packed (2015). Access to engine from cockpit and inside companionway. We installed solid lifelines around cockpit for added security. 45 LB Manson Supreme(2014) Rodes-150ft 3/8 BBB with 150 ft of 5/8 Sampson Super Strong double Braid(2014). 50ft 3/8 BBB with 200 ft 5/8 Yale October Plait(2014) stored in divided anchor locker forward of Vberth. Plus 15Lb Danforth stern anchor with 15 ft of 5/8 chain and 150 ft of 1/2 plait, stowed in stern anchor locker with hinged lid hawsepipe. Custom dry head( also called composting head) . The holding tank and all fittings are still installed. So to convert back to regular marine head simply requires a new head and hose. We are very happy with the dry head and plan to install this system in our next boat. We have a Hella fan and norco day night solar vent installed in the head compartment for great ventilation. New multilayer foam cushions with fleece or terry cloth removable covers. In main salon: Two big fans, Camfros with timers, norco day night solar vent, 6 opening bronze ports( no leaks) and one big hatch. The fixed swim ladder on port stern quarter has an emergency quick deploy. Simply pull on lime green webbing and ladder will pop open and down. I made this for mob at anchor or any situation where a swimmer unexpectedly finds themselves in the water, they will always have a way onto the vessel. Viking rescue 6 man coastal life raft (new 2015) always stored inside boat. Never wet, damp, or in the sun. Engle MT 45 fridge or freezer. If you are not familiar with this wonderful product. Engle will act as a fridge or freezer. We use it as a fridge, holds a lot, draws very little. Hot summer day in the Bahamas, most it draws 20-30amp hours per day. We just had her hull scrubbed by a diver,(2/2016) he said the hull is in fantastic condition. There have three coats of Trinidad SR from the bottom job in late 2014. The diver thought was e had just had the bottom painted 🙂 . Kinda cool when a diver tells you what a lovely bottom you have :-). Winter 2014 bottom job. Three coats of Trinidad SR. Crossing Over. Back To The States. Sorry I’ve been remiss in my blogging! Things have been a bit crazy. We had a family emergency, but things are calmed down and stable, whew! We are back aboard Rain Dog after 9 weeks in Texas. I originally routed us to Dinner Key from south Bimini but within an hour or two after leaving port we decided to head for Ft Lauderdale( faster and better tack). As expected it was a mad house upon arrival, but more madhouse due to it being, ugh, boat show weekend. Plus, one thing we did not anticipate was that most fuel docks were out of fuel. Fueled up we make our way to a marina. By now, we have been up for over 24 hours and fatigue was setting in. Rested, and now have met up with Brian’s parents so we have a car! Now the wild goose chase begins, checking back into the U.S.
Nondescript “second building”. This is the second building we went to looking to check in. Both buildings are on airport property and due to construction it took two laps around the airport to get to “first building”, but the customs office was also under construction. A tiny note on bare drywall, where the door to customs should be, told us to go to another address. Two laps around the airport later 🙂 we reach “second building” Once inside we see that the first floor holds a private airline company, no customs office in sight. Asking for customs the airline attendant pointed us towards a door marked exit…? Brian’s parents came aboard and helped Brian sailed Rain Dog down to Key Largo. This is Rain Dig in front of Gilbert’s restaurant, hotel, and marina. Meanwhile, I dog sat Brian’s parents dog Piper, and rested up in a cute little cottage down near Marathon. I rejoined Rain Dog when the boat got to Key Largo. Key Largo. Brian’s parents headed up to Sanibel island while Brian and I sorted out some boat repairs. We had planned to sail to boat to marathon but family in Texas needed us. As luck would have it, we found a RV for sale nearby. We named her Gertrude. The RV allows us to stay next to my parents RV in Texas. Before we headed to Texas we were blessed with a visit from friends we made while at Black Point, Bahamas. Stevie and Richard. Coincidentally, Richard was Staying in the same RV park as our new RV Gertrude. Less then a week back in Florida, Rain Dog is settled in a slip, we packed up our new RV Gertrude and headed for Texas.. Stopped in Sanibel overnight to visit with nephews and family( vacationing, they live in Austin, tx). We were supposed to spend a full week, but with my father being ill, we just stayed a day. The boys enjoying the Bahamas sea shells I collected for them. I only collected dead/empty shells. Eli taking picture of the family. Back on the road. We will get to see our nephews, Brian’s sister and brother in law, and Brian’s parents again when we meet up in Austin. Texas here we come. Scupper enjoying the landlubber life. In Texas! Mom greeting us as we pull into the RV park. Brian builds a deck for my dad so he can get in and out of the RV easier. Mom, ever the hands on woman, helps Brian with the deck. We hopped over to Austin to see the nephews, family, and friends. Brian got to see Oliver! I’m so jealous!!! This is our friends Sheila and Jason’s spectacular son. Purple hair! My niece picked out the color for me and did most of the applying with my nephew Warren helping out. Back at the RV park. I installed a fantastic fan aboard Gertrude. Mom loved the fan, so mom and I installed two aboard their RV. Their RV is named after the boat they circumnavigated in. The boat, a Tartan 37 hull#2, was called Tigger, so the RV is called Tigger Too. After 9 weeks in Texas, things have calmed down. My father is doing really well on his new medications. So we decide it’s time to get back home to Rain Dog. I’m glossing over the part where both Brian then I get the flu (the real flu). Sick as a dog for almost 20 days. We have been cruising aboard our little boat, very isolated, I guess our bodies were not used to all the people contact and their landlubber germs. Land is so dangerous, don’t know how the dirt dwellers do it :-). Gertrude is a great vessel. We did have some tire issues, but the repair was $40! Then we hit a bad stretch of I-10 in Louisiana and our exhaust pipe coupler gave out. I got out my bosuns bag ( I don’t leave home without it 😀) and tied it back up with webbing and tinfoil covered dyneema. Worked beautifully. Stopped near Orlando to meet up with our friends Gordo and Karen. Forgot to take picture of us at the restaurant :-(. Lame-o. The RV park where we stayed the night was really a mobile home park, 55+ community. But they didn’t seem to mind us youngins hanging about. We told Gilbert’s Marina in Key Largo that we were coming back to Rain Dog. We failed to mention that we were in a monster RV. They took it in stride and kindly allowed us to overnight in what has got to be the best RV parking spot ever. Happy to be home, can’t wait to get out to anchor! Scupper is sooo happy to be back home. We will head north tomorrow and weather out a northern in Barnes sound. I’m sorry I’ve been neglecting this blog. We are back in the states to help out my parents. I have much to catch you up on but that will be in a couple weeks when we are back on the boat and I can sit and focus . In the mean time. All my sailors friends. If you could be on the look out for a vessel adrift. 26 foot Morris Francis, flush deck. Her sails are not up but they are not stowed as the owner was just running ashore to check in. If you are in the area, know someone in the area, know someone who may know someone in the area, please put the word out. Coast Guard is not searching for her because there are no lives aboard. Sailing vessel Dagny. I smudged out a red fender in the picture, this fender is not aboard so wanted to make the picture of what you may see when spotting Dagny as accurate as possible. She still had her sails stowed on deck, no covers. Projected Drift Analysis, thanks to Chris Parker the weather router!! We are gonna find her!!! Marine Weather Forecaster Chris Parker of the Marine WeatherCenter had so generously provided us with the following update on the projected drift of the unmanned S/V DAGNY which went adrift from West End, Bahamas on December 22, 2015. Please share this information to fellow cruisers transiting the coastal waters of Northern Florida and Georgia. Please report any sighting to the United States Coast Guard (USCG) and Seven Seas Cruising Association (SSCA) Radio Station “KPK” at KPK@ssca.org or telephone 941-456-5070. The vessel drifted about 25 miles in a direction of 320T in 24 hours. This makes sense, and confirms the roughly 1k speed of drift. My guess was between 1k and 1.5k speed of drift due to wind. Assuming there were no tidal currents, the speed of drift may be closer to 1k in wind of 15k, which is slightly less than I was estimating. So the vessel started drifting from 26-40N/79W at about 5:30pm EST on Tue22. Was sighted 27-04N/79-16W at 5:20pm on Wed23. At 5pm on Thu24, I estimate position 28-12N/79-45W, based on drift from wind 30 miles, in direction 320T & set from current 48 miles in direction 355T. At 5pm on Fri25, I estimate position 29-30N/80-10W, based on drift from wind 25 miles, in direction 310T & set from current 45 miles in direction 348T. At 5pm today (Sat26), I estimate position 30N/80-30W, based on drift from wind 22 miles, in direction 320T & current about 10 miles in direction 345T. and 22 miles in a direction 340T Sun27 night-Mon28 (yielding a Mon28 evening location of 30-36N/80-48W). and 25mi in a direction 360T Mon28 night-Tue29 (yielding a 5pm Tue29 position 30-51N/80-48W). Of course, all of the above is only an educated guess, and the possible errors compound over time…cheers…Chris. Here’s the revision: At 5pm on Sat26, I now estimate Dagny might lie near 29-53N/80-30W, based on drift from wind of 20mi, in direction 310T & set from current about 10 miles in direction 345T. At 5pm Mon28, I now estimate Dagny might lie near 30-21N/80-56W, based on drift from wind of 16mi, in direction 325T. At 5pm on Tue29, I now estimate Dagny might lie near 30-36N/80-59W, based on drift from wind of 15mi, in direction 350T. At 5pm on Wed30, I now estimate Dagny might lie near 30-50N/80-56W, based on drift from wind of 15mi, in direction 010T. At 5pm on Thu31, I now estimate Dagny might lie near 30-59N/80-50W, based on drift from wind of 10mi, in direction 030T. I’ll reiterate: Of course, all of the above is only an educated guess, and the possible errors compound over time…cheers…Chris. If you have access to any resources that may be able to help contact: me, oceangirlcd30@yahoo.com, Glenn Tuttle KPK@ssca.org , gil ( owner) gil@keskydee.com or you can comment here on the blog. Carolyna n RAy on New Blog!